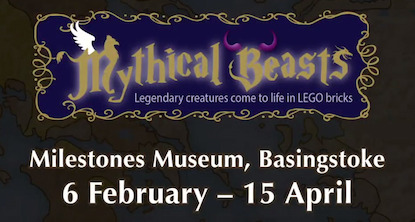 Pandora's box has opened at Basingstoke's Milestones Museum, and mythical LEGO� beasts have escaped onto the museum's streets. Take on this new LEGO challenge, suitable for adventurers of all ages, recapture the legendary creatures and save the day! With the help of the wise Owl of Athena, and the special app and trail to guide you on your quest, travel around the museum, track down the beasts and return them to the box. A unique event for classical early music aficionados to immerse themselves in the beautiful harpsichord and vocal music of baroque/medieval Lamentations, in the sublime setting of the Sacred Heart Church in the centre of Reading. This will be a rare opportunity to enjoy performances by world renowned artistes rarely seen in the UK. See us also on Facebook Events: Concert Gorzkie Zale - Lenten Lamentations, Reading. This concert explores the theme of Remembrance. We commemorate the life of Ben Pedley, a second year Chemistry student who died in a road traffic accident in 2017. We present music that was meaningful to Ben in the first half of the programme, celebrating his love of a diverse range of songs and piano music. The second half of the concert is a performance of Karl Jenkins: The Armed Man, A Mass for Peace. In the centenary year of World War 1, this piece reminds us of the horrors of war, and the urgent need for nations to come together in peace. Plan your perfect day at Berkshire�s most prestigious two-day bridal exhibition, Bride: The Wedding Show at Ascot Racecourse on 10-11 March, which will bring together more than 90 of the region�s finest wedding suppliers under one roof from venues to bridal designers, cake-makers to stationers and photographers to florists. There will be sensational choreographed catwalk shows taking place three times daily at 11.30am, 1.15pm and 3pm showcasing a selection of the latest bridal fashions, live music on the caf� stage, a champagne bar to lend even more sparkle to the occasion. A day of discussion, storytelling, poetry, sculpture and sustenance in celebration of the feminine and International Women's Day. Women are invited to come help to create a wonderful atmosphere of sisterhood and creativity. Spaces need to be booked in advance and payment to be made at the time of booking. This popular event has become a favourite in the calendar for families, those who love the countryside and racing fans, with a great programme planned. The day starts with The Lucy Lines Leading Rein Dash at 11.30 followed by a parade of hounds at 12 noon. Racing proper gets underway at 1pm, with six races scheduled. Last year�s event attracted more than 80 entries with some thrilling racing over the three mile course, which has a mixture of permanent and portable fences, a downhill back straight and an uphill finish. In addition to the racing, there will be a fun fair, bouncy castle and face painting for the kids, plus trade stands including artwork, jewellery, fashion, country clothing, hats and gifts. New for 2018: a Food Village offering pizzas, homemade pies, cakes, cocktails and a selection of drinks. The Bracknell Bees are playing their 30th season of senior Ice Hockey, currently in the National League Division 1 South. Their rink seats 3100 people, there are usually seats available for all games. Downstairs spectators sit behind plexi-glass which surrounds the entire ice surface. Upstairs, spectators are above the plexi and the puck can enter the spectator�s area with little warning. The rink is well insulated and the ambient temperature is usually fairly warm. In line with the new laws the entire John Nike Leisuresport Complex is now a non-smoking venue. The internet is always changing, and being able to keep up to date with your children's use of technology can be a challenge. To help parents navigate the world of social media Arlington Business Park, Theale will be welcoming a team from Childnet to host a free workshop on Tuesday 13th March. Using the internet, mobile phones and games consoles are now an everyday part of young people�s lives. So, whether you�re puzzled by parental controls or would like to know more about Social Media, the workshop will guide parents through the way children can now use and access the internet. 15/03/2018 LATE NIGHT AT THE MERL - DIG IT! Discover the ABC of Soil with the Soil Security Programme! Experience a worm�s eye view of the Architecture of Soil. Dig deep into the Biology of Soil with real-life critters. Create the perfect climate for plants at home by exploring the Chemistry of Soil. Get your hands dirty making a biodegradable plant pot and planting seeds. Investigate the importance of soil in the fight against alleged climate change. Find out if we can make a healthy soil for Life on Mars! Cocktails available and live music from Dolly and the Clothespegs. Join us in Bracknell to take a look at all our artwork, we have a wide range of different styles of art and also a free book giveaway for all visitors. Preservation and Promotion of the Arts (PAPOA) is an incorporated charitable organisation with a number of concerns. Our aim is to promote and preserve arts in all their current forms. Our primary focus is to make the arts accessible to individuals who otherwise may not have the opportunity, time or inclination to engage. We hold regular events all over the country to preserve and promote the arts. All our events are free to attend. Discover the benefits of outdoor learning! Come and join in outdoor activities inspired by the themes and collections of the museum. Enjoy outdoor play and explore the natural environment. Each session involves story-telling, craft activities and singing. Friday Fledglings is run by Charlotte, a local teacher and Level 3 Forest Leader. Suitable for families with children under 5 years old. In post-War London, the Ministry of Biscuits casts its sinister shadow over every elevenses in the land. Established to 'control biscuits', it prohibits decadent products like Gipsy Creams. But when Cedric, a junior designer, falls in love, he designs a biscuit to shake confectionery to its very foundations, and his world is turned upside down. Inspired by Ealing comedy and Orwell's 1984, this satirical musical comedy by acclaimed author Reeve and playwright and composer Mitchell is revived in a new version. Supported by the Lantern Theatre, Brighton, where it has just completed a highly successful run, the show is touring round the UK. Suitable for all ages from 7 up. Starring Murray Simon, Amy Sutton and Radio 4 regular David Mounfield. Starts 7.30pm.